This guide will help you to build Spring Boot RESTful CRUD Example with MySQL Database. As we know, making REST service in Spring Boot application is super easy and fast. Spring Boot data provides CrudRepository interface for generic CRUD operation in org.springframework.data.repository package. To create a connection with the MySQL database, we need to configure data source properties in the application.properties file starting with spring.datasource.*. Spring boot uses spring-boot-starter-data-jpa to configure spring Java Persistence API (JPA). Save the user submitted data into the database. Fetch particular data from the database by a given ID. And delete a record from the database. CrudRepository is an interface which provided by Spring Framework itself. CrudRepository extends Spring Data Repository which is a central repository marker interface. CrudRepository provides the generic method for create, read, update, and delete (CRUD) operation. <S extends T> S save(S entity): Save and update a given entity. Entity can not be null and the saved entity will never be null. Optional<T> findById(ID id): Retrieves an entity by its ID. ID cannot be null. void deleteById(ID id): Deletes the entity with the given ID. ID cannot be null. Find the table structure of the MySQL database used in this example. Building a Spring Boot RESTful CRUD application, you need the following dependencies. 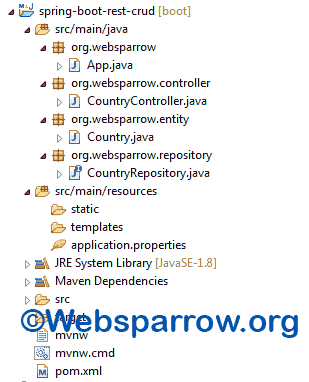 Configure datasource, JPA properties, etc in application.properties file. These properties automatically read by Spring Boot. Create a Country model class, define its attributes and annotate with @Enitity and @Table annotation at the top of the class. @Table annotation is used to map your existing database table with this class and @Column annotation map table columns. Note: If the table is not available in your database, @Entity annotation tells Hibernate to make a table out of this class. 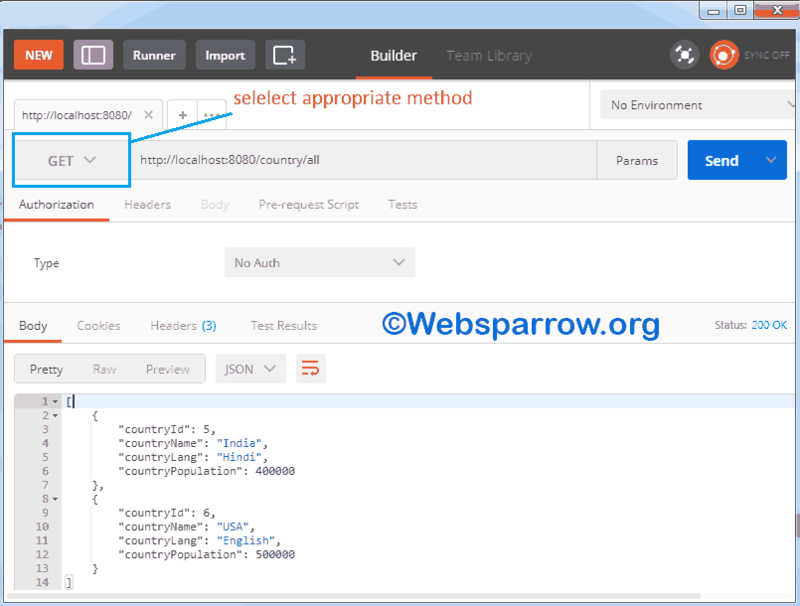 Create a CountryRepository interface which extends CrudRepository. This will be AUTO IMPLEMENTED by Spring into a Bean called countryRepository. Create CountryController class which handles the user request to perform create, read, update, and delete operation. Learn more about @RestController and @Autowired annotation. 1. To add a new country use the http://localhost:8080/country/add URL, select the POST method, set Content-Type="application/json" in the Headers tab, select raw in Body tab and paste the following code. 2. To fetch all country list use the http://localhost:8080/country/all URL with GET request. 3. Similarly, you can perform the update and delete operation. For update, use PUT and delete use DELETE request.